Home Architecture Have You Been to These Offbeat L.A. Museums? The Valley Relics Museum is full of neon and more. Have You Been to These Offbeat L.A. Museums? You’ve been to LACMA and the Getty, the Broad and MOCA. The Hammer? Yep. Same goes for the Autry, the Norton Simon, the Skirball. We applaud you, oh culture vulture, but for every well-known cultural institution in L.A., there is an under-the-radar alternative ripe for exploration. This goes beyond the Museum of Jurassic Technology, which has garnered a cultlike following for its befuddling, non-dinosaur- and non-technology-related curiosities. For starters, a few doors down from the Jurassic is the Center for Land Use Interpretation, whose hyper-focused exhibitions—Centers of the USA, about the eight U.S. regions that claim to be smack in the middle of the country; Executive Decisions, which documented every place that all of our presidents have ever lived—treat the national landscape with an almost spiritual reverence. If you prefer your spirituality straight up (and you’ve already visited Silver Lake’s Holyland Exhibition, bursting with goodies from explorer and evangelist Antonia Futterer’s expedition to the Middle East), the Bhagavad-gita Museum is nearby, too. Eleven intricate dioramas outfitted with stationary and animatronic figures tell the story of Hindu scriptures. Culver City’s also home to the Wende Museum (you go, Culver City! ), a collection of more than 100,000 pieces of Cold War-era personal effects, art, and propaganda, from a vandalized bust of Lenin to Stasi espionage equipment. In the mood for nostalgia-tinged pop culture? 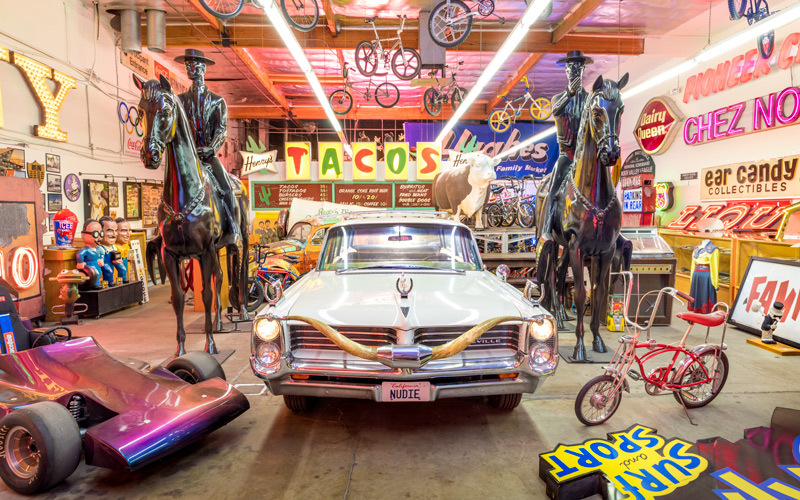 The Valley Relics Museum has your medicine: Tommy Gelinas’s scruffy Chatsworth warehouse is stuffed with a mishmash of treasures, like Canoga Park’s neon Mustang Liquor sign (along with the eagle at left) and rodeo tailor Nudie Cohn’s custom 1975 Cadillac. For something more highbrow, swing through Arlington Heights’ Underground Museum, a family-run art collective that, in partnership with MOCA, showcases exhibitions of mostly African American art. If you see Beyoncé there, play it cool—she’s been known to drop in.